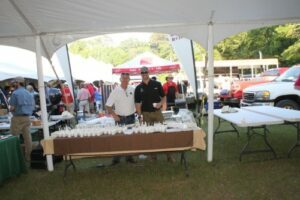 It was yet another record year at the 2018 Alabama Wildlife Federation (AWF) Cook – Off for the Tri – County chapter. John Hall & Company is proud to have participated for 15 years now and plan on doing so for many years to come! The attendance this year was higher than it has ever been with around 1,800 people visiting and enjoying all the different wild game dishes that were prepared by 40 different cook teams. Seafood, venison, bison, alligator, pork, and all the way to desert! The list of dishes goes on and on. John Hall & Company prepared a desert dish that seemed to be a favorite of many. Over 600 servings of banana pudding with a dash of Wild Turkey whiskey were served! The AWF wild game cook-off is truly a great event. People and sponsors from all over come to participate and support. This event is not only a way to support AWF and their mission to teach people about the conservation of our wildlife here in Alabama, promote resource stewardship, and insure the hunting and angling heritage for years to come, but it is actually accomplishing those goals. People whether they are avid outdoorsmen/women or have never experienced the outdoors at all are getting the opportunity to try and taste wild game and what Alabama’s wildlife and natural resources has to offer. Each attendee who purchased a ticket was given a one-year membership and subscription to AWF in hopes to engage their interest and educate people about the importance of conservation and the mission of AWF. John Hall & Company is a proud supporter of AWF and will continue to because without organizations like AWF our way of life and the outdoors that we love so much would not be the same.